I can’t believe the hype generated by the H1N1 virus. I was recently informed about a speaker in our area that is telling folks that the swine flu is part of prophetic fulfillment of Revelation. I believe this type of thing is pure scare-mongering and is leading to more worry and anxiety than is due. I can’t help but wonder if ‘speaker’ such as this are only promoting an agenda: Their wallet. I wrote an article about H1N1 that I think addresses some of the hype and also some real facts about it and how to minimize the spread of the virus. 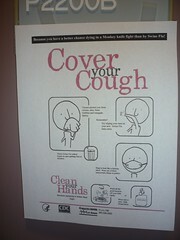 It can be read online at: http://healthmad.com/conditions-and-diseases/swine-flu-pandemic-or-panic-demic/. It appalls me that our churches are being used as a forum to spread fear. And it saddens me that folks unwittingly are being taken in by these kinds of people. I implore you, when you hear a teaching, search the Scriptures for yourself and see if it lines up with God’s Word or if it is being distorted into another message.